Have you ever wondered how much of your life and your behavior is dominated by your habits? It’s safe to say that many of the habits we learn are incredibly useful. Habits mean you can drive your car (once you’ve learned how) without much thought at all. The assocations we form can help keep us safe, for example – that touching a stove is dangerous because it’s hot. On the other hand what about the habits that aren’t so useful? The food we eat (or don’t) th e exercise we do (or don’t) and so on and so forth. That’s where this insightful book enters the picture. How can we change the habits that we don’t like? It turns out (as with most things) the first step is to uncover or recognise the habit. In other words – you have to want to change. Get that part started and then read this book for some amazing stories and facts on how the brain works and how habits can be changed. I read this book just out of pure self-interest, but as it turns out, it’s also incredibly relevant to marketers. The different marketing examples weaved throughout are brilliant; touching on AA (for alcholics), McDonalds and even the selling of toothpaste (creating the tingly feeling helped set up a habit). “Every McDonald’s, for instance, looks the same—the company deliberately tries to standardize stores’ architecture and what employees say to customers, so everything is a consistent cue to trigger eating routines,” writes Charles. Even the training of Michael Phelps into a champion through the use of habits is touched on. 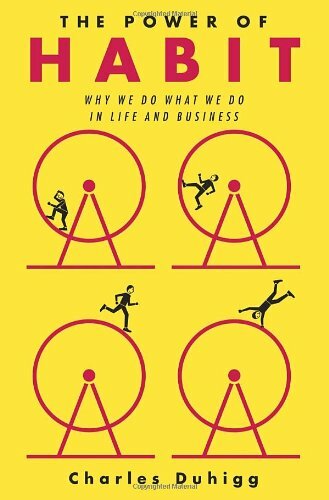 Business wise, the book delves into ‘keystone habits’ and how businesses can use these to transform their practices and culture. For example focusing on safety as a key habit to trasnform (and then this leading to across the board changes).